So last weekend I tried something new - the ALCMB and Ancmeca, organisation for old office equipment in France, organized a regional meeting in the village of Wasselonne, in the Alsace region of France, close to Germany. Pictures of that meeting can be found here. Since there were to be trade stands, as well as an exposition, I decided to take a fair number of calculators to give a bird's eye view of calulator history. I'd like to put that story in writing here as well, if you have no time to endlessly browse through the pages on my website, here's your guidebook, with just a few of the highlights. 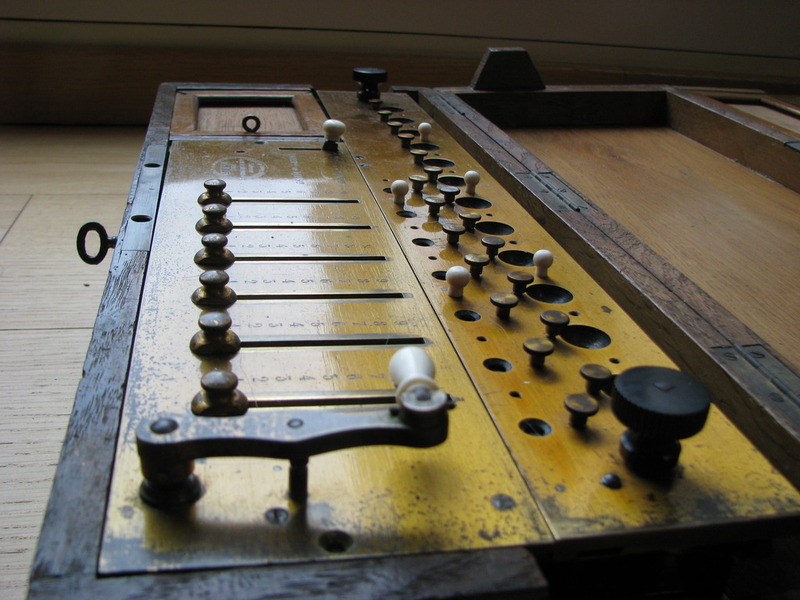 The story starts with Thomas de Colmar's arithmometer - the first commercially available calculator in the world, that could easily be bought (if you had the money ...) from approximately 1850 on. It finally provided all the solutions needed for succesful mechanical calculation in a small package that was more or less reliable - a very important selling point indeed, and throughout the history of mechanical calculation - if your calculator was caught out making an error, as a manufacturer you lost your unique selling point for doing calculations mechanically in the first place. The machine used Leibniz' cylinders, which are stepped drums, that can rotate a gear from 0 to 9 teeth, depending on the position of the gear along the axis of the cylinder. This is however not the most important problem of calculating mechanically - the real difficulty is in making the carries for overflowing decades. If you add 1 to 99999999, you should get 100000000 as the result. This carry-upon-carry-upon-carry was what was generally perceived as the issue with Leibniz' machine - although it has been demonstrated that with a bit of patience, carries are handled reliably there too - just not in one turn of the crank. Thomas figured out a few different ways of doing this reliably, and then finally got up to speed in producing the machines. 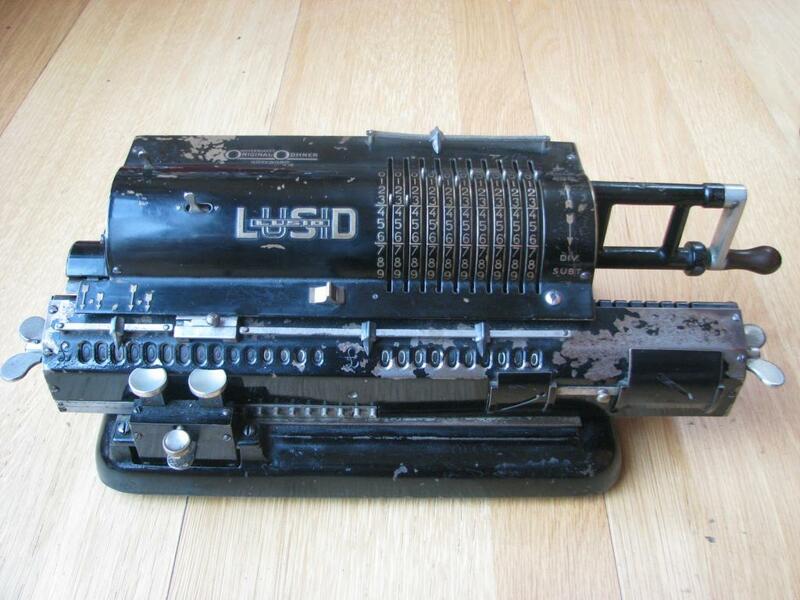 I thus have one example of the first real commercially successful calculator on sale, the 1865 model, built in 1881. It can be found here. 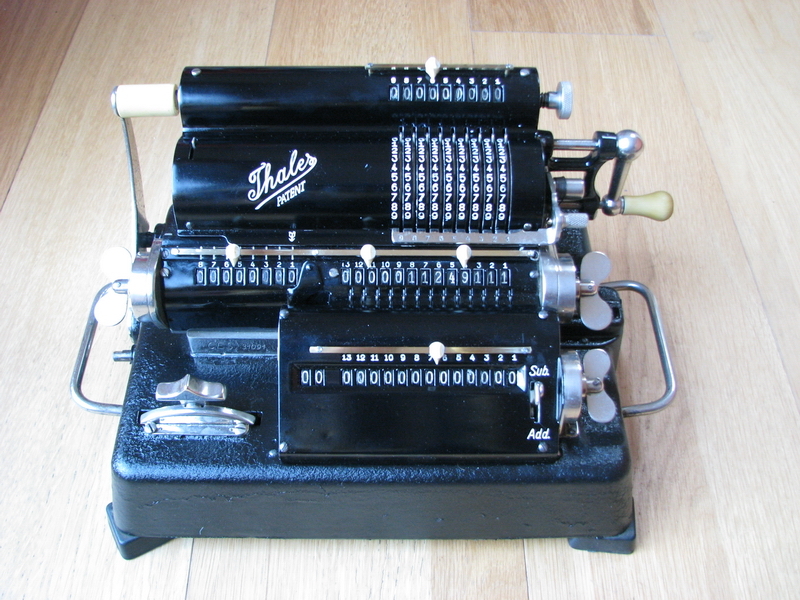 Around that time, an expatriate Swede living in St. Petersburg, Russia, Willgodt T. Odhner tried to collect enough money and sponsorships to get his own calulator project off the ground, based on a completely different kind of operating principle - the gear with variable number of teeth, or pinwheel, where pins could be shifted into and out of the body of the wheel by operating a small input lever, and thus used to calculate. 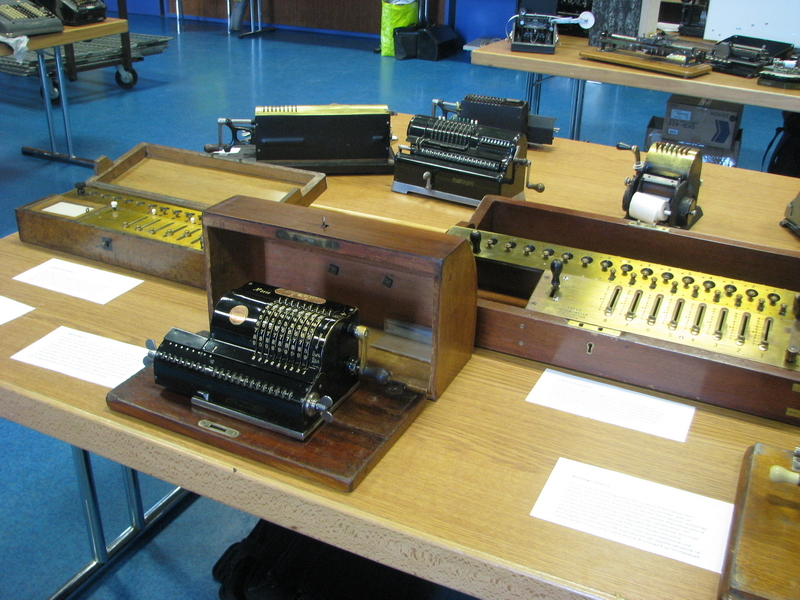 Carries were handled by extra pins on the resulting stack of disks, that could be switched on and off at will by a mechanism in the carriage. The machine worked well, was more compact than the Thomas arithmometer, and definitely cheaper, but needed more force to operate and was noisier. 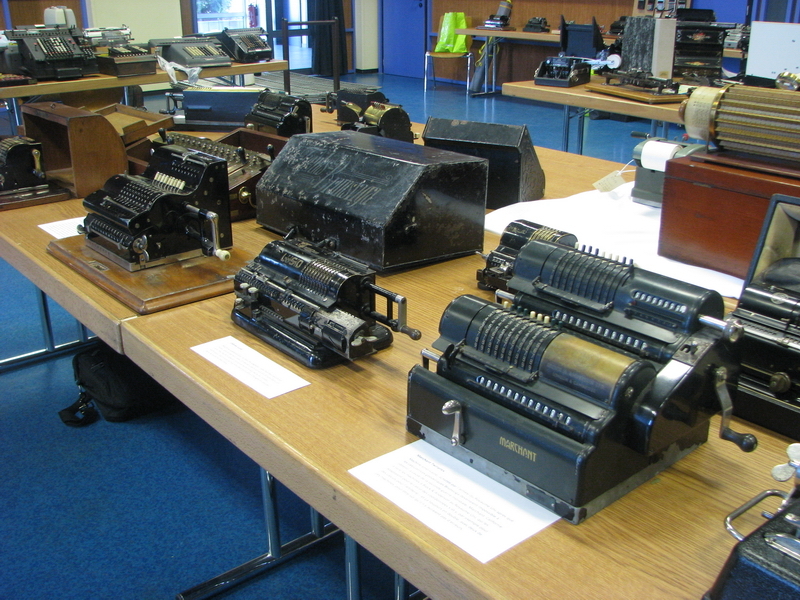 Of the 3 remaining Odhner machines of the very first series in 1878, none are in private hands. But I have detailed pictures of two of them here. 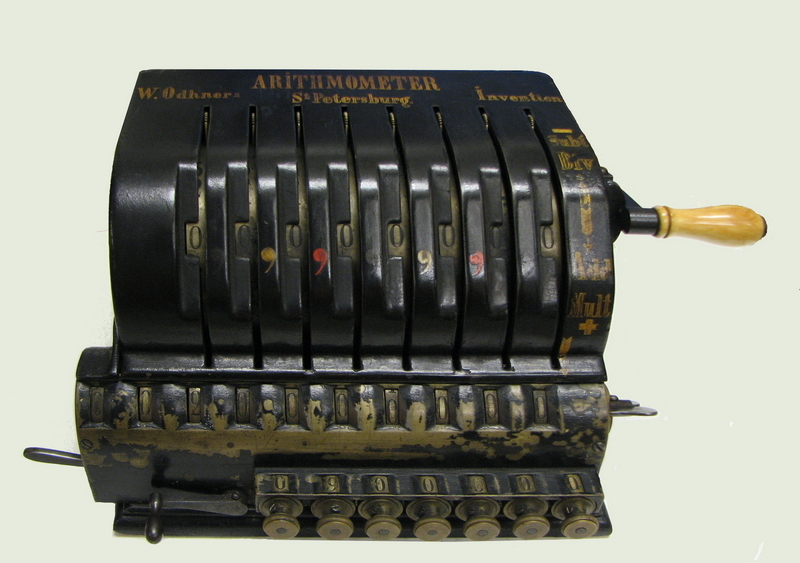 By 1886, Odhner finally started production in his own factory of the improved model of the Odhner arithmometer - I have one of those machines, and details can be found here. This machine probably dates to around 1900, when the sales rights for much of Europe had been sold to Grimme, Natalis and Co, which produced the very similar Brunsviga, but in larger numbers, and soon enough incorporating obvious improvements, such as safety interlocks for misoperation, as well as a longer crank, which prevented the operator's fingers from being hurt with the carriage to the right side. That did not stop Odhner from winning the gold medal at the 1900 Paris exposition with a machine which was by then decidedly outdated, whereas the Brunsviga, with many obvious improvements and higher popularity and sales, had to do with an honorable mention. In the mean time, the fame of Thomas' machine had had the time to grow, while the alternative newcomer with pinwheels was still very new. Machines had been gifted to important personalities all over Europe, and export soon followed. Machines also ended up in the Black Forest, where clockmakers soon felt that they could do a reasonable copy of such a machine - Burkhardt started this in 1878. Machines also ended up in London, where some of the issues of fragility and reliability of the Paris machine prompted Samuel Tate to design an improved one, that would be much more robust and reliable. He succeeded (at a price though ...) and the virtues of the resulting Tate arithmometer were extolled by all who saw it and worked with it. And it is indeed a much more sturdy and practical machine, not in the least because of the much improved clearing. My example is here. We will now take a jump of a few years and look at one of the greatest disadvantages of the pinwheel machine: because the setting pins rotate together with the pinwheel cylinder, they can only have a certain size, in order to pass through the other parts of the carriage. This means that long calculations rather start hurting the fingers of the operator - there is one story (to which I can find no reference) that the authors of the first real computational chemistry paper (James and Coolidge in 1933) operated their Odhner type calculator until their fingers bled to calculate the energy levels of the hydrogen molecule in a truly variational manner. Despite the bleeding fingers, they are famous in a much more limited circle today than Bryan Adams with "Summer of 69". In any case, Franz Trinks, the head engineer of Brunsviga, decided that something must be done, and a pinwheel system developed where the setting pins remain stationary, so they can be made much larger and easier on the fingers. Several patents for several different systems were taken out, and the one to finally make it into commercial production around 1907-1908 was the Brunsviga J. It did so, however, at a severe cost, because the number of parts as well as the assembly time was much larger than for a regular pinwheel calculator. Only 2997 examples were sold in several variations until the end of production in 1915. It was cumbersome to operate, as the operator had to switch the machine from "setting mode" to "calculating mode" and back by either pressing a heavy thumb button, or by moving the clearing crank forward a few degrees. 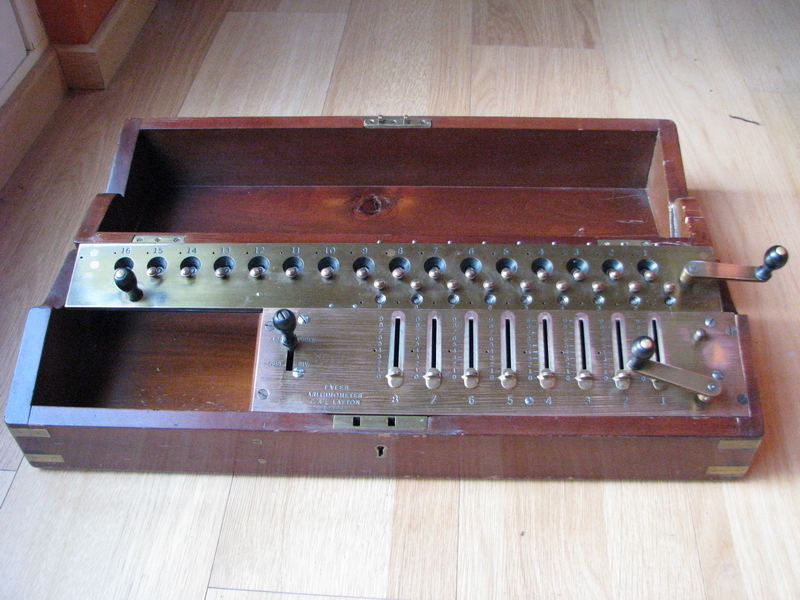 An Italian count, Roberto Taeggi-Piscicelli, came up with another innovation - a different system of long, non-moving setting pins, as well as an extra memory bank, and coupled with an electric motor, in a machine that was far, far ahead of its time in both ergonomics and ease of use. Due to the quality standards employed for the parts and materials, it priced itself out of the market though. 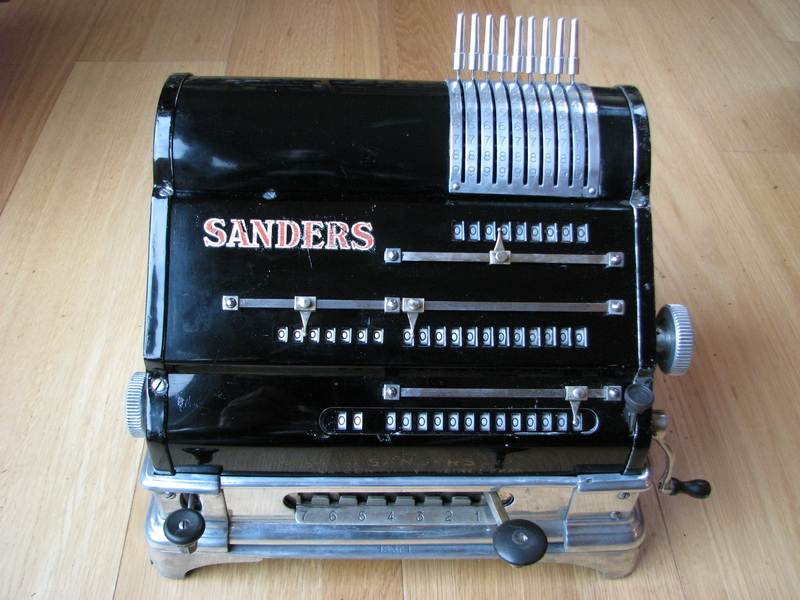 The 1911 Sanders calculator is a machine to behold - here. On the other end of the spectrum, manufacturers tried to make their machines as cheap and easy as possible. One way of doing this is reducing the size of the parts to use less raw materials - the other is reducing the number of parts, by reducing the capacity of the machine. Obviously, the latter can rather severely limit the functionality of the machine. The most extreme example of this is perhaps the Triumphator K2. Why anyone at Triumphator would have thought that this was a good idea remains an open question. Its page is here. 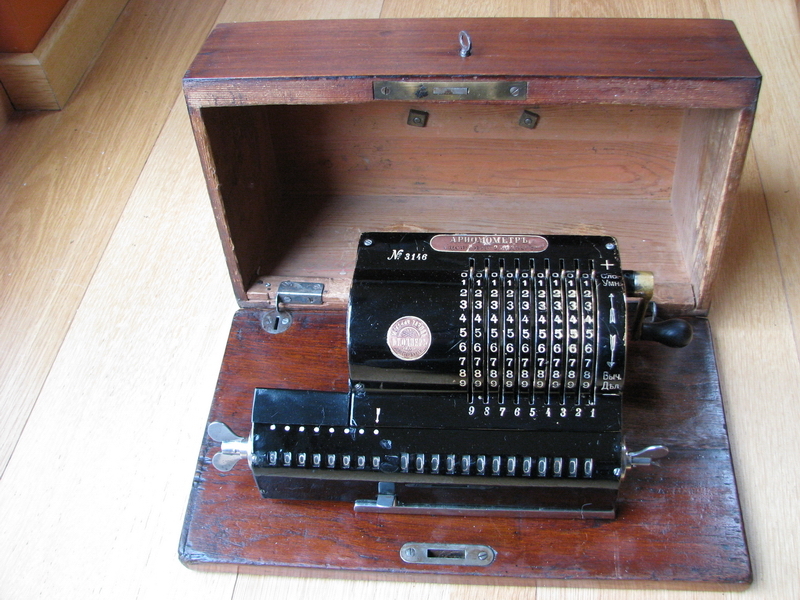 Another chapter in pinwheel history was written by the Odhner firm in the 1920s, who attempted to do the impossible - make a pinwheel calculator in the old non-decimal English currency system. This necessitates a decimal display in base ten, with the carries being effected after 12 pence into shillings, and after 20 shillings into pounds. 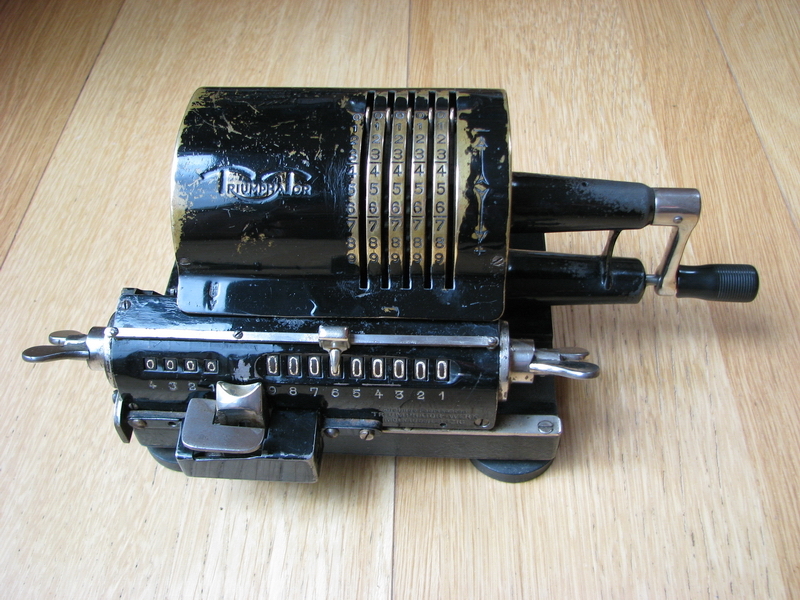 To add a bit more complication, they made the machine switchable, so it would also calculate in plain decimal, and provided a mechanical conversion table from shillings and pence to thousandths of pounds. The result was a machine with operating instructions the size of a book, that is counterintuitive in many ways. You can read all about it here. 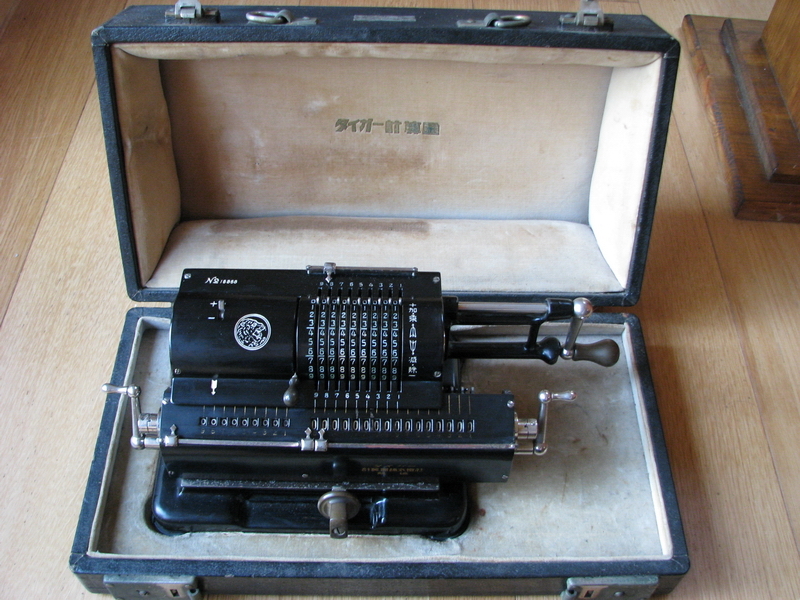 Our final pinwheel machine is a Japanese one, the Tiger basic, very well developed and essentially a copy of the basic Odhner layout. Well constructed and executed, it is a pleasure to operate, and comes with a handy velvet-lined box and dust cover. More information here. Yet another innovation was the advent of the geared sector system, which was another operating principle than pinwheels, which also allowed for non-moving setting levers. Developed by Christel Hamann, the example I'm showing you below, immediately is an example of something else too. 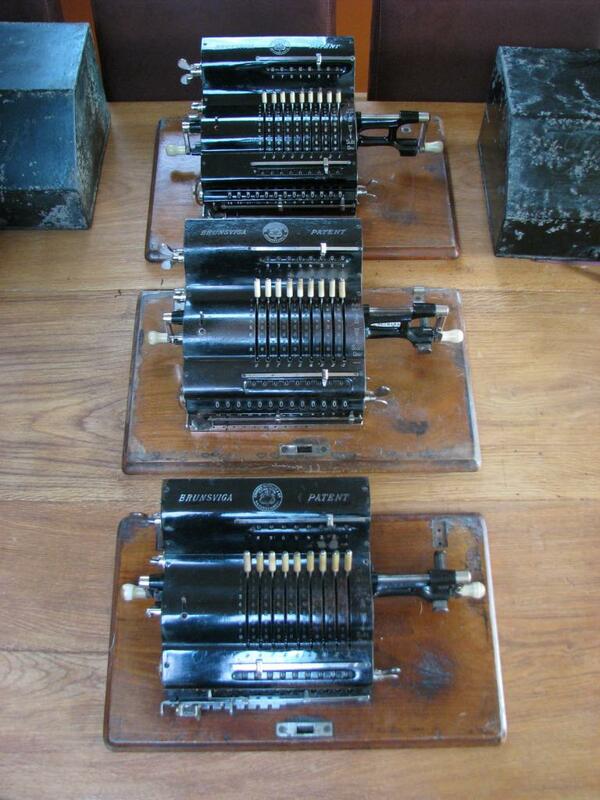 The system was adopted by Marchant in California, to develop a range of machines with a quite characteristic look. During World War II, the British army was in dire need of calculators to use for artillery calculations - what should be the elevation of the gun to reach target at a certain distance? The easiest and fastest way to solve this kind of 2-dimensional coordinate problem is with a geodetic or double calculator, where the same operation can be done on two coordinates by only cranking in a factor once. Details on various geodetic calculators and their operation are here. 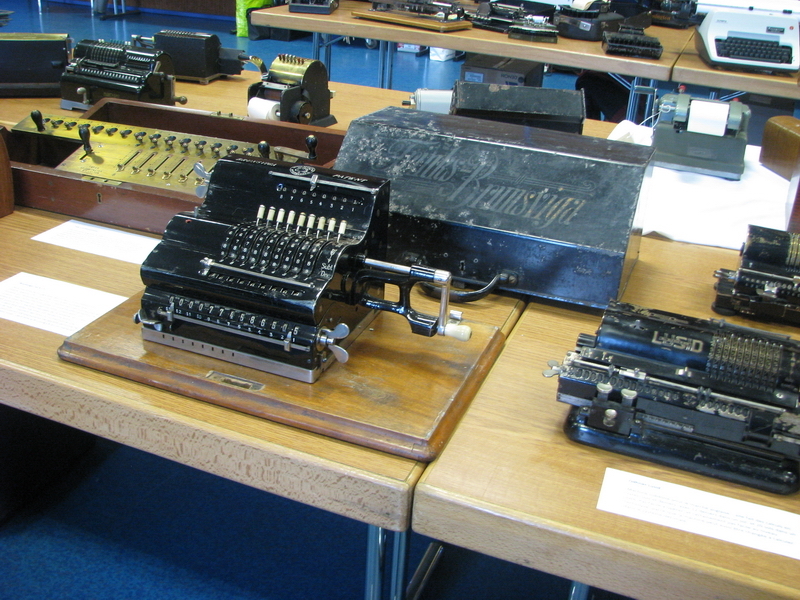 The issue of the British army was that the most common geodetic calculators were made by Brunsviga, in Germany, and they happened to be at war with them, which makes purchase of goods that are critical for the war effort just that little bit more difficult. 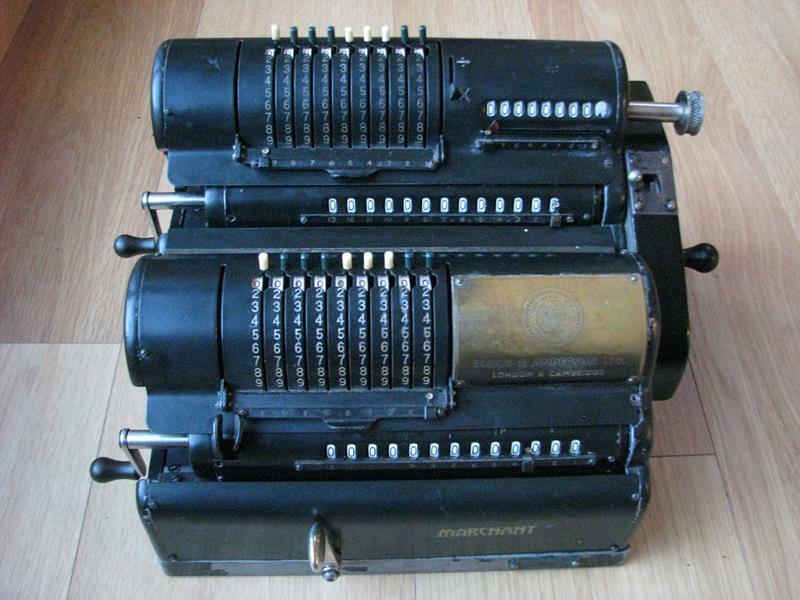 So a crash program was set up with the only British manufacturer of pinwheel calculators, Britannic, who indeed did develop a geodetic calculator in a rush, but either through mechanical problems, or because production was too slow, the army decided in 1943 to look for another solution, and they bought pairs of Marchant XL calculators, which were then mounted onto a base block, adapted slightly, and provided with a gearbox to switch the relative direction of the machines as necessary. This was done by the firm of Block & Anderson Ltd. in London, and provided the army with the geodetic calculator they needed. The story of its restoration is here. Other ideas and refinements were developed - an extra memory bank with an item counter to easily make sums of products was taken up by various manufacturers - see the Sanders higher up, already in 1911. But this is Thales' idea with the CES. It provides both addition and subtraction in the memory, but no back transfer of the values to the result or setting register. Later incarnations such as the DER/S are able to do all of that, which makes the machine much more versatile. 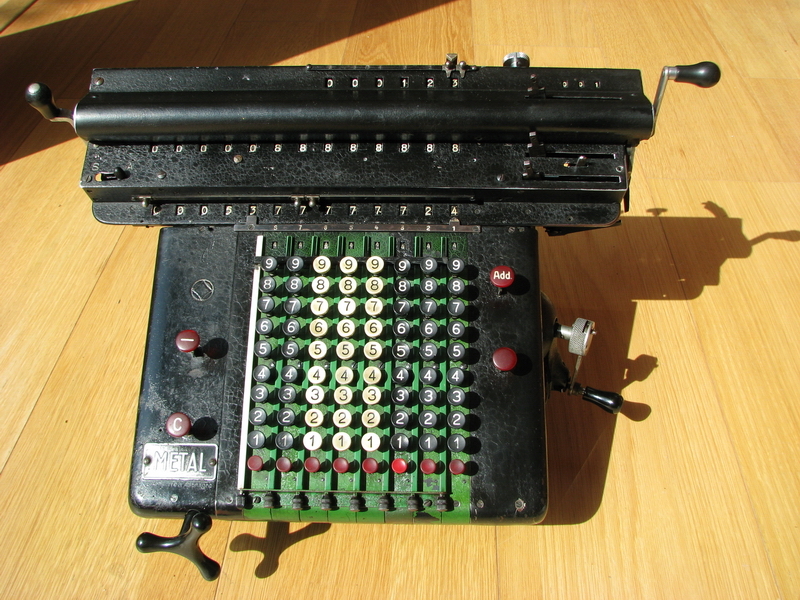 Thales also developed a printing calculator, the CER/D, along the same principle as the much earlier Brunsviga Arithmotyp. Once a result has been arrived at, it needs to be transferred to the setting register, from where it can then be printed. That means also a lot of extra levers to pull, and a result that is limited to the capacity of the setting register. All of that is more than a bit clumsy, and the machine, predictably, was not much of a succes. 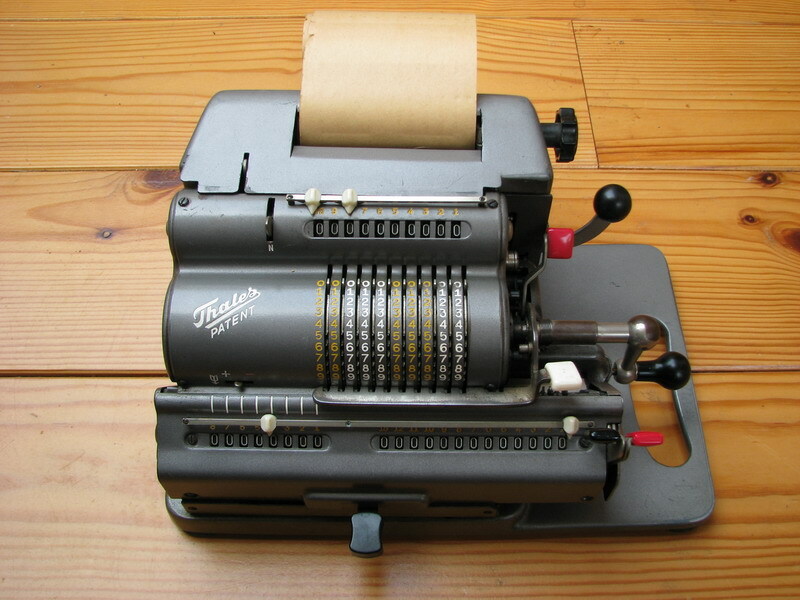 Operations which required a printout were mostly just additions and subtractions, and those could be done much faster and less painfully on a printing keyboard adding machine than on a pinwheel calculator. Finally we return to the stepped drum idea, with a fully equipped keyboard stepped drum machine, with extra memory and item counter. The manufacturer is Rheinmetall, and the machine was sold under the METAL brand in France. For details on the operation of the machine, as well as the reason why this particular machine is a bit special, you can find its page here. 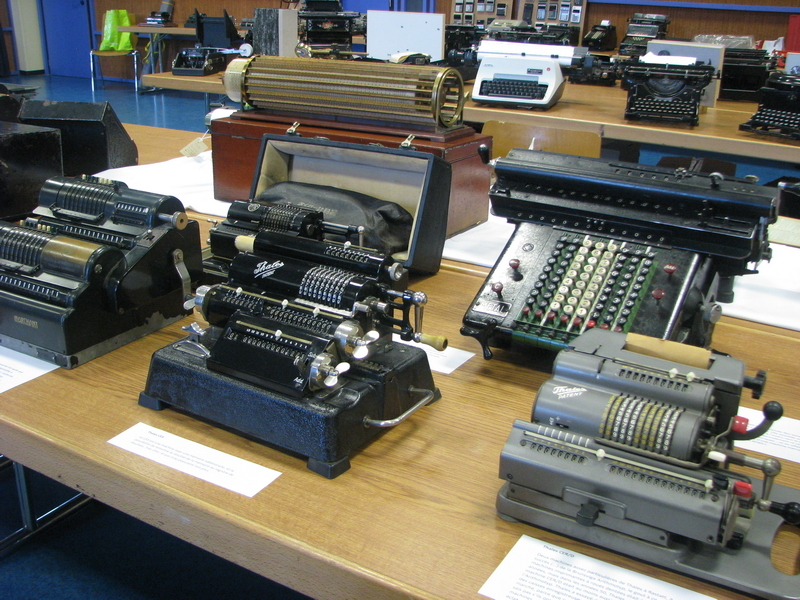 So this concludes our haphazard little tour through four-species calculator history, based on some rather random machines that I picked from the collection for display. While I was writing this, I kept thinking of about 10 other machines that would be interesting to mention in every paragraph, but for this you'll have to explore the list of machines by yourself. I may do a few more of these walks through part of the collection, based perhaps on various themes I can think of. For now, I hope you enjoyed!